I’m writing this at the instigation of fellow UK Wikimedia member Matt Jukes following on from last week’s successful Bristol Girl Geeks vs Wikimeet event (news passim) with a few thoughts on a couple of the barriers to contributing to Wikipedia and its sister projects and raising the project’s woeful gender imbalance (87% male in terms of contributors). It could be basically summarised as implementing 3 Es – engagement, encouragement and education. I’ll try to deal with these below, although not necessarily in that order. Firstly, as was rightly raised by guest speaker Fiona Apps, there’s the off-putting matter of having one’s initial tentative contributions mercilessly edited or deleted (“reverted” in wiki-speak) by other, sometimes overzealous editors and admins. One remedy to this disappointment suggested by Fiona was that new contributors engage in discussion about their contributions (have you ever noticed the ‘Discussion’ tab at the top of every Wikipedia article, let alone clicked on it? Some visitors don’t even notice the ‘Edit’ tab on each article. Ed.). The same advice could be given to experienced editors and admins: try to avoid giving the impression of displaying excessive zeal. Another factor that could deter new or potential contributors was pointed out by Matt: great big warning notices – along the lines e.g. “this article is a stub…”, “…does not meet quality standards…”, “…reads like a press release…”, etc. – and that’s just some of the less intimidating ones – splashed all over pages next time one looks is, to say the least, a little off putting. Experienced contributors know the reasons for the insistence on quality, neutrality and so on, but these might not always be apparent to newcomers. This brings me onto the matter of encouragement. Wikipedia does have a system in place for rewarding its contributors. As Wikipedia is an international collaborative project, any recognition/tokens of appreciation need to be relevant to the recipient to be fully appreciated. Your correspondent has received a barnstar for his efforts; other tokens are available. 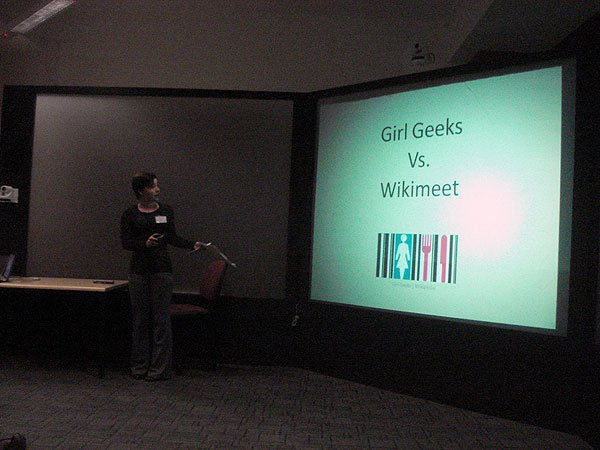 Finally, the Bristol Girl Geeks were almost unanimous in their criticism of the Wikipedia editing interface. Even though a WYSIWYG editor is available and various enhancements for it are available to increase its functionality, it was still felt to be clunky and non-intuitive. I know this is constantly being worked upon by the developers, although whether it ends up being as easy to use as an ordinary word processor is a moot point. That’s got my thoughts down in print. If you have any thoughts of your own on them, please feel free to comment below. I do think Wikimedia UK are working really hard to bring new people into the fold and the level of outreach they have been doing this year has been really impressive to see. That said I do think Wikipedia does remain one of the more intimidating online communities to get involved with if you are going to be anything less than fully committed for all the reasons mentioned above. I too would echo your words re the editing interface, particularly as I am also being impeded from doing more by some of the obscurities in formatting/editing, more specifically adding references/citations (perhaps it’s me needing to read – and absorb – the help materials properly). Maybe some advanced editing tuition is needed for (slightly more) advanced contributors in addition to that provided for prospective new contributors. A wiki is not a word processor and most of the difficulty of editing wikipedia comes from them changing the traditional wiki markup, so I usually have the help in one window next to the editor. If it went back to being a simple wiki markup, that would be easier, but I doubt there’s much chance of that now.